THESE WORKS, which were established in 1843, have gradually grown, until, at the present day, they constitute the largest Railway Works in the world. They give employment to 7,500 persons; and to these may be added over 700 engine drivers, firemen and others at the steam sheds at Crewe Station. The Company have built and own 845 workmen’s cottages. They manufacture and supply gas, not only to their own Works, but to the whole town of Crewe, and they also supply water to the works and town, the supply being derived from the red sandstone at Whitmore, about 12 miles distant from Crewe. The ground upon which the Works stand is about one-and-a-half miles long, and its area is 137 acres, of which 48 are covered in. 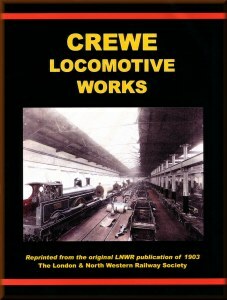 The Works are in close proximity to Crewe Station, the most important junction on the London and North Western Railway, and 158 miles from London; they are divided into three main groups, which are spoken of as the 'Old Works', the 'Deviation Works', and the ‘Steel Works’.